However, we already know it will be less than £10,000. But how much less will come as a shock to anyone who just bought an SUV or anyone who is trying to sell them. While not quite cheap as chips, the 4WD Dacia Dusters models will also be offered at prices that will have jaws of SUV salesmen dropping despondently. While the likes of Range Rover Evoques can command premium prices of £50,000 plus, you'll be able to buy four 4WD Dacia Dusters for that, and have enough left over for a Dacia Sandero. Dacia opens UK order books for its hotly-anticipated Duster SUV range in just over a fortnight’s time, on 28th June, the same day as it confirms pricing and confirmation. As well as providing customers with exactly what they want, at “shockingly affordable” prices, without superfluous extras, the standard warranty for Dacia in the UK, like other markets, will be 3 years/60,000 miles. In addition to providing a warranty which they can trust, supported by parent company, Renault, the fledgling marque will offer extended warranties for five and seven years, from launch. The new options will allow cost-conscious buyers to compare Dacia’s unrivalled value-for-money products directly with several key rivals and their similar warranties as standard. The first upgrade gives a 5 year/60,000 miles warranty for only £395, while an even lengthier 7 year/100,000 miles warranty will also be made available at £850. Each warranty includes Roadside Assistance for the duration of the policy period and covers roadside repair or recovery. The level of cover does not drop in the extended warranty period, outside of the standard three-year/60,000 miles either. The warranty is applicable at the time of registration, while extended warranties can simply be specified at the time of purchase. 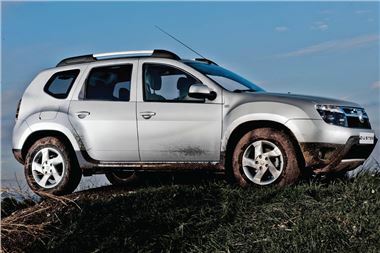 With Dacia models boasting such ‘shockingly affordable’ price tags, even after adding on the costliest warranty option, at £850, compared to forking out for its rival models, whether it be a compact SUV or even a traditional hatchback, UK buyers will be better off compared to the competition to the tune of several thousand pounds. With such savings easily attainable, there should be easily enough left over to treat the family to a sun-drenched summer holiday, or even a hefty sum to put towards adding another Dacia to the household, when the all-new Dacia Sandero supermini launches in January.